It’s about time someone other than me started using “bird” and “books” in the same sentence. Bravo! I also recently read a book about one of my favorite topics (aside from food) — Books: A Memoir by Larry McMurtry. Yum. McMurtry is, of course, the famous story writer whose many literary achievements include The Last Picture Show, In a Narrow Grave, and Lonesome Dove, which won one of those Pulitzer Prizes you hear so much about. “Books: A Memoir” is about McMurtry’s endless passion for books: as a boy growing up in a largely “bookless” world; as a young man devouring literature with a rare level of gusto; as a fledgling writer and family man; and above all, as one of America’s most prominent booksellers. I am not sure this book is for everyone (hey, few books are). It is perhaps best appreciated by fellow true believers — those of us who think a day is incomplete until we’ve spent some quality time with bound pages. All I know is that while I read this book — which, by the way, is divided into very short chapters — I got excited to finish just so I could start another one. When I was introduced to Harriet Tubman in grade school the Underground Railroad almost sounded like a good time. All that sneaking around and hush-hush meetings with “friends” in the middle of night seemed akin to an adult version of kick-the-can — at least to my woefully insensitive ears. That reference point stuck in part because nothing ever replaced it. Tubman’s life is underwritten; she plays a prominent role in dozens of children’s books but only a bit part in those without drawings. It’s hard to believe it took until 2004 for a serious biographer to tackle Tubman’s story. But, after I recently read Catherine Clinton’s fine biography — this book, like several other bookseller picks, is on sale at River City Books for 25 percent off until the end of July — I have an inkling why: there just isn’t a lot of material to work with. The lives of African-American women were not well documented in the nineteenth century. This reality presented Clinton, who has multiple Ivy League degrees, with an unenviable task — and left gaps this reader wanted filled in. I got the sense the author shared this frustration, too, as at times Clinton reaches for something that isn’t there. But, given the handicaps, I forgive the instances when the writing didn’t blow me away. More important is what someone with Clinton’s research chops did provide: a substantive portrait of Harriet Tubman’s fearless, important and brave life — and a much-needed revised reference point for my now slightly more educated mind. I know why it’s called Crazy Daze: because it’s always so hot that people go wacko. I realize the forecast is not calling for a similarly sizzling afternoon but I won’t believe it until I see it. I am planning on red hot sun and white hot deals. There will be so much to see and do along Division Street tomorrow. Assuming you’ll be among the masses, I hope you’ll stop by River City Books. My sources tell me they’ll offer thousands of new titles — here I am talking about books that are being brought in just for the wild and crazy day — at bargain prices. Plus, the books will be on display beneath a shady tent! Of course, the indoor store will also be filled with great movies, music, air conditioning, and much more. I know I’ll set the alarm tonight as Thursday will start early — 7 a.m. — and I want to be among the first to snap up the bargains. Happy Crazy Daze 2008 to all! People all over the country are doing it. No, I don’t mean going to see The Dark Night. I’m talking about a different form of action that Batman surely would endorse: They are signing a declaration of independence. But this is not your great, great, great, great grandfather’s Declaration of Independence. No. It’s something more 21st century, and in order to sign this declaration one does not have to wear a wig or sit inside a sweaty room. River City Books is a proud member of IndieBound — a successor program to Book Sense (long live Book Sense!) that has the ambitious and important goal of rallying passionate readers around a celebration of independent stores and independent thinking. 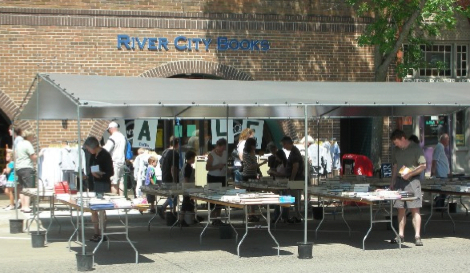 IndieBound is about raising awareness, it’s about reaching out, and it’s about taking pride not just in River City Books but in the community RCB serves. By now it’s well established — this isn’t the lone opinion of a stray bird — that independent bookstores benefit everyone. They help local economies; they create good jobs; they leave more tax money at home; they are much more environmentally friendly (has that ever been more important? ); and they help build and sustain unique communities. It’s a good time to stand up and join fellow individuals in the IndieBound mission of supporting local businesses and celebrating independents. You can sign the declaration here. And, of course, you can support your local bookstore here. Local is good — that’s no Joker. A few months ago, Mrs. Raven and I acquired a puppy. Never mind that dogs are typically larger than birds; he’s our pet — not the other way around. Anyway, this bundle of joy has created some challenges primarily because, well, we have a bit of a language barrier. But, alas! 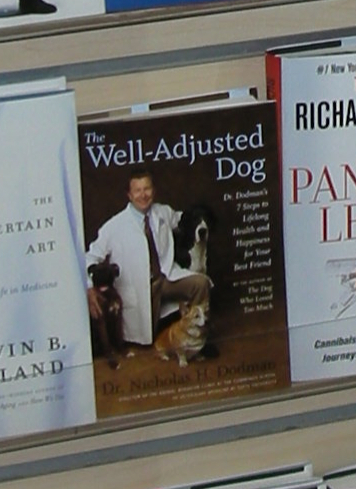 I was browsing down at the old neighborhood bookstore and I spotted a new book I think is really going to help us raise a healthful and happy four-legged friend: The Well-Adjusted Dog by Nicholas Dodman. They have their so-called Great Wall over there on the other side of the world not too far from where they’re holding the Olympics (by the way, why isn’t bird watching an Olympic sport?) in a couple of weeks. So! I know a pretty darn good wall or two myself and, wouldn’t you know it, I spotted said wall inside the old neighborhood bookstore. Store manager Jon Lee really has a knack for arranging book in an enticing way — I say that of my own accord, I swear; the fact that they give me a discount for writing this here blog has nothing whatsoever to do with it (or at least very little to do with it) — and I really like the way he uses the walls just inside the front door. 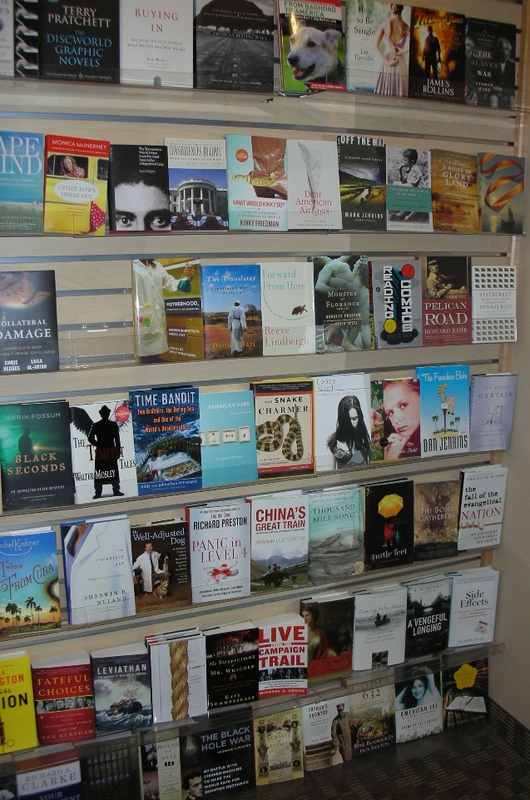 I snapped this photo a week or two ago so some of these titles may have shifted spots, but all are available. See if you can find something good to read on more renowned walls. I bet you a gold medal you can’t.